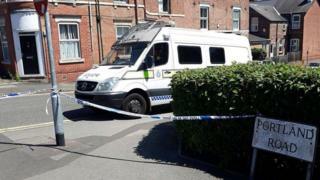 A man has been arrested on suspicion of attempted murder in connection with a shooting that left a teenager with serious injuries. The 17-year-old suffered chest and hand injuries after being attacked at the junction of Ireton Street and Portland Road in Radford, Nottingham, at about 23:00 BST on 29 June. Police said the victim's injuries were not believed to be life-threatening. A Nottinghamshire Police spokesman said investigations were "ongoing".